Cyber-criminals use weaknesses in software and apps to attack your devices and steal your identity. 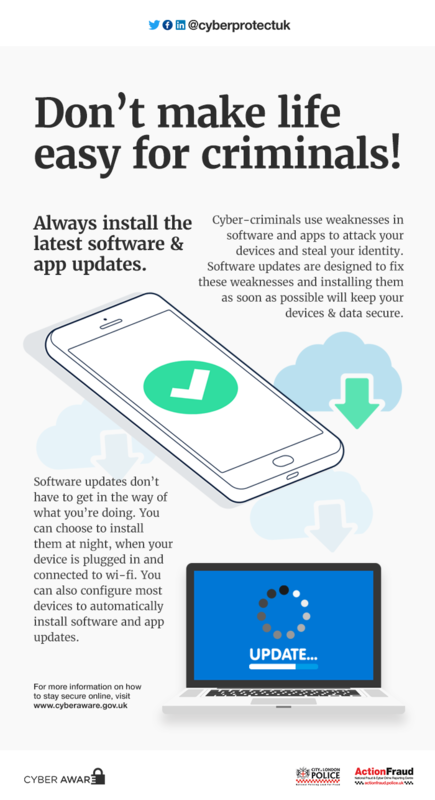 Software updates are designed to fix these weaknesses and installing them as soon as possible will keep your devices & data secure. Software updates don’t have to get in the way of what you’re doing. You can choose to install them at night, when your device is plugged in and connected to wi-fi. You can also configure most devices to automatically install software and app updates. For more information on how to stay secure online, visit www.cyberaware.gov.uk or follow @Cyberprotectuk on Twitter.